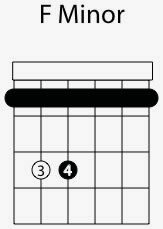 Here is one of the most common shapes for an F minor chord. This voicing uses the E minor bar chord shape and it is one of the most difficult chords for newer guitar players to make. If you need more help on playing bar chords you can always go to the bar chord lesson.